RIDAT is a leading UK manufacturer of thermoforming equipment with over 60 models and 50 years of manufacture. Ridat’s range of machinery are robust and well-engineered, with many of the earlier versions of the vacuum forming machines and related ancillaries like blister sealers and roller presses still operating satisfactorily in over 65 countries around the globe. Ridat thermoforming machines were and still are acknowledged as the work-horses of the industry. In 2002, Ridat was acquired from Europack Engineering Co Ltd and merged with RCS Thermoforming to become Ridat Company. Ridat’s robust engineering and advanced design features guarantee high productivity, long life with minimum maintenance and sturdy performance, where high volume or smaller, for both high volumes and short runs at affordable prices. 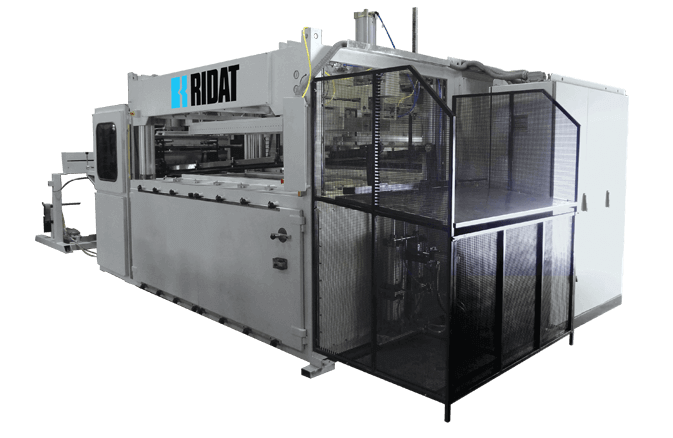 Ridat provides a one stop, single source of packaging plant – manual, semi-automatic and automatic vacuum forming machines and related ancillaries like blister sealers and roller presses. The basic thermoforming machinery range is augmented by a choice of ancillary equipment. Ridat’s range of thermoforming machinery covers vacuum forming & pressure forming; skin & blister packaging, automatic handling systems and design of packaging systems. In addition, the Company offers a full consultancy design service to assist with mould design, selection of material and advice on process technology. Ridat vacuum forming machines range from the smallest being model 1714M Manual Vacuum Forming Machines (432mm x 356mm) to the largest model 10048AVF Automatic Vacuum Forming Machine with Duplex Heaters (2500mm x 1200mm). Ridat blister sealers are available in several sizes as shuttle, rotary or inline units, in varying degrees of automation to suit individual needs and budgets. And the Ridat Roller Presses are available in different sizes and can be readily fitted with extra conveyor lengths.